Taste test: These kettle chips were excellent, crispy with a good crunch. 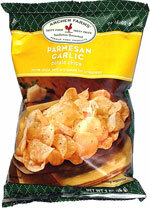 However, they didn't have much Parmesan flavor and were very garlicy, which isn't a good thing unless you love garlic. Eat these and you'll be toting around a garlic aftertaste for a while. If you like garlic, these are for you. If you don't, or you're on the fence, try something else. 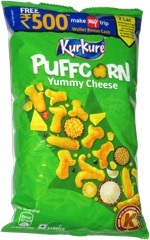 The bag says the chips are flavored with "a hint of garlic." A hint? Smell test: Like kettle chips, strong oil smell.